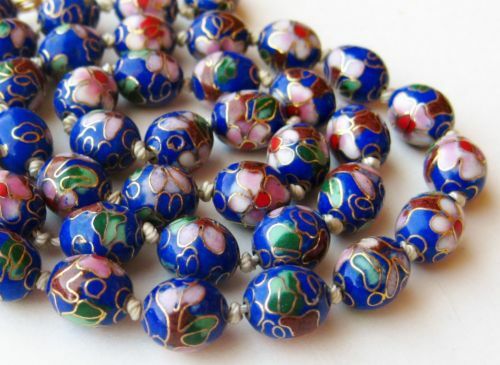 The word cloisonné comes from mid 19th century French, literally translated ‘partitioned’. This makes perfect sense when we examine how the art is made; by creating partitioned or divided spaces on the surface of an object to be filled in with enamel. 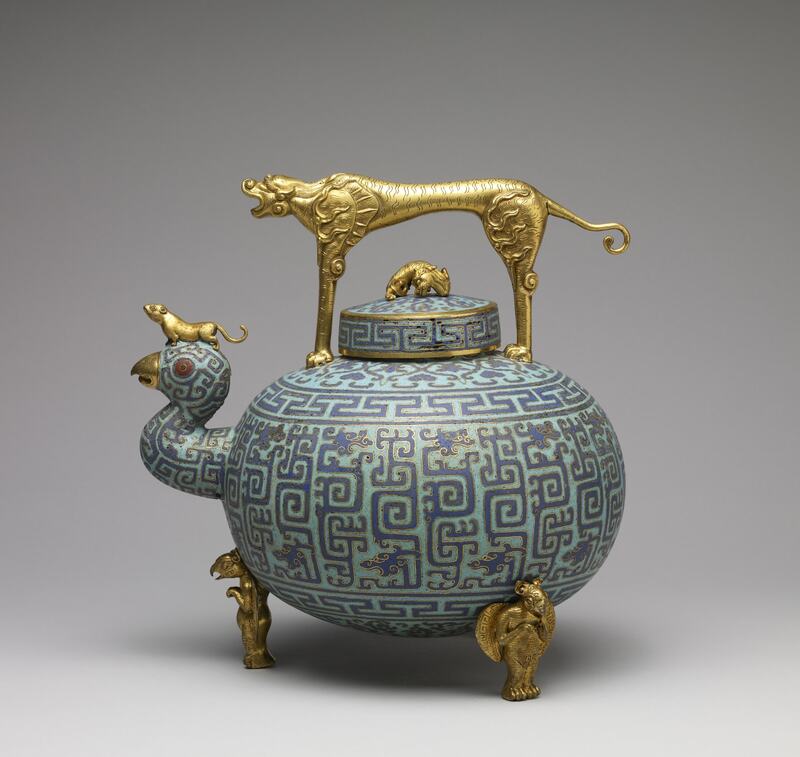 However the art far precedes the modern name, with the earliest surviving cloisonné pieces dating to the 12th century BC. 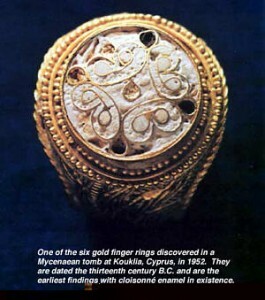 They were rings found in a tomb on the island of Cyprus, an island in the eastern Mediterranean known to be one of the earliest places to produce copper. These six rings were decorated with cloisonné enamel that had been fused in place. 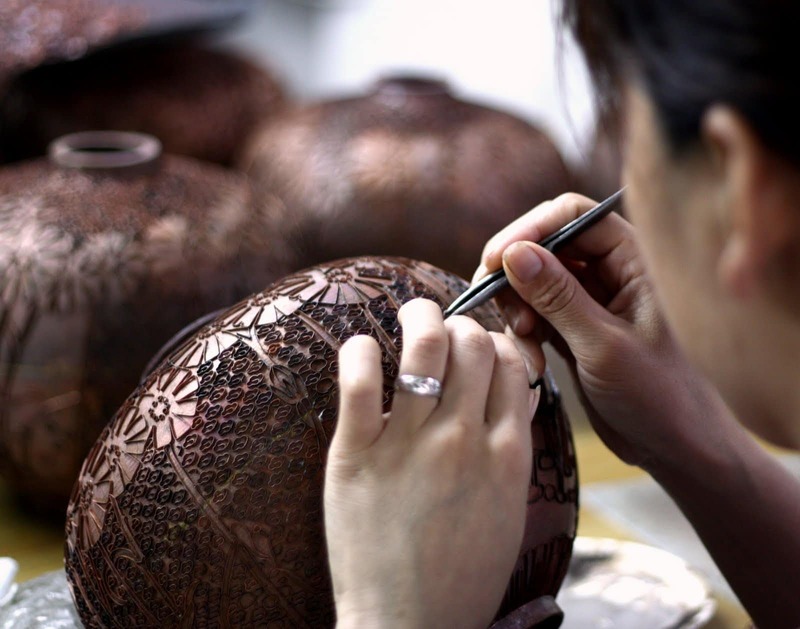 Even the most basic cloisonné process has many steps. First an object is chosen, often a vessel like a vase or box, made from copper or other mixed metals. A blue print for the outer layer is often sketched out before the labor begins. 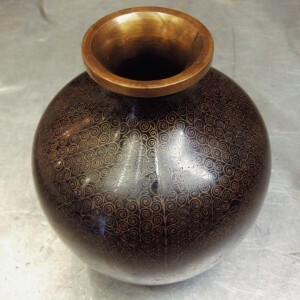 Next, copper is pressed paper thin and hammered, smoothed, cut and twisted into intricate designs to be affixed to the vessel. Hundreds of small copper pieces can be used, often bent at right angles to create these patterns. Red copper is almost always used for its extreme malleability. 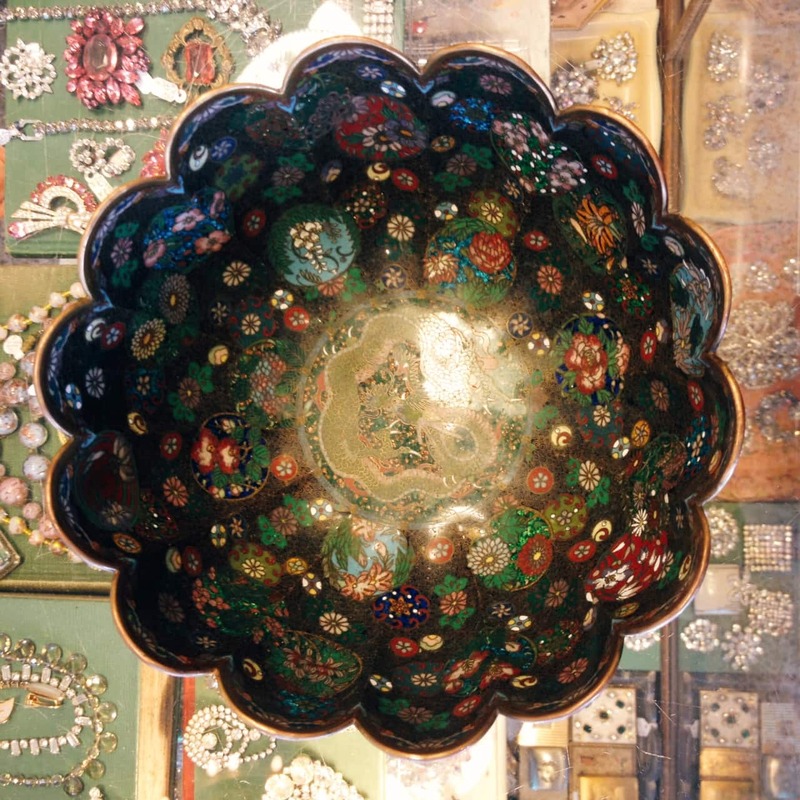 The artist would then affix the worked copper to the object using a strong glue, taking great care to create the perfect shapes to be filled with color. The piece is then fired to permanently adhere the copper design in place, with the help of the glue. Any excess glue is burned away during this step leaving the partitions clean and ready to be filled. Small metal shovel tools and eye droppers are used to add color into the negative spaces created by the copper wire. Vitreous enamel, also known as porcelain enamel, is used. This is a combination of powered glass and substrate that is heated up and mixed, then cooled to create a thin paste. Each divided area is filled using these colored mixtures until the picture is complete. The work is then fired again to set and harden the enamel. The baking process can cause the enamel to sink down creating the need to fill the cloisons and fire the piece repeatedly to finish this step. Last the artist polishes the object until the wire edge and enamel fill are smooth and level. 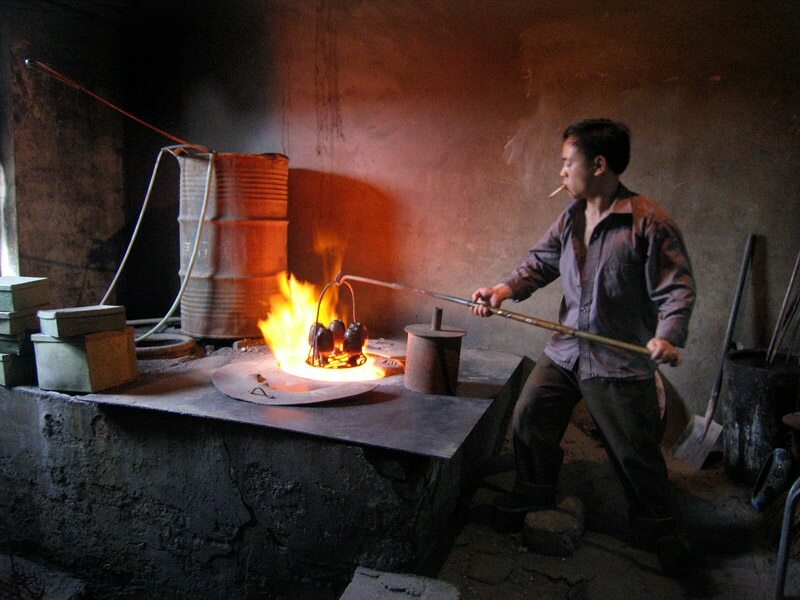 It is entirely possible that the technique of enameling was independently invented in different regions throughout the world. 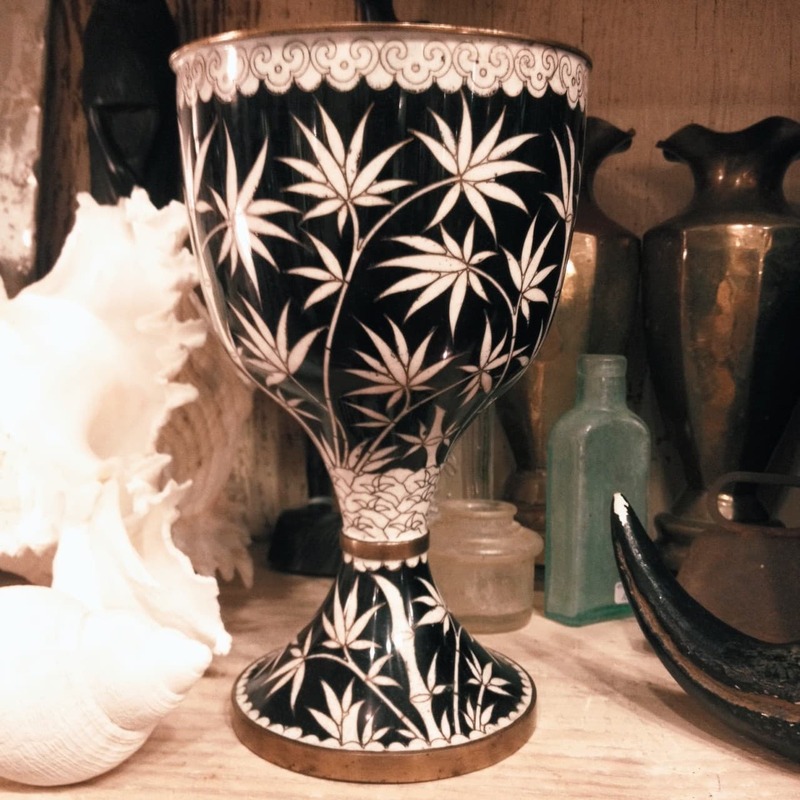 However it appears that the Byzantine artists in the 8th century were among the first to use the style regularly and begin to shape the techniques we still use today. These craftsmen began to use much thinner wire to more freely create complex designs. From Byzantium the technique would eventually reach China through trade in the 14th century. No Chinese pieces earlier than this are known for sure, however the oldest dated pieces from China show a full use of the skill, suggesting considerable experience. Cloisonné was originally regarded with suspicion by the Chinese, being foreign and having feminine qualities. The early Ming Dynasty however, boosted its production as the Jingtai Emperor was particularly fond of the look. 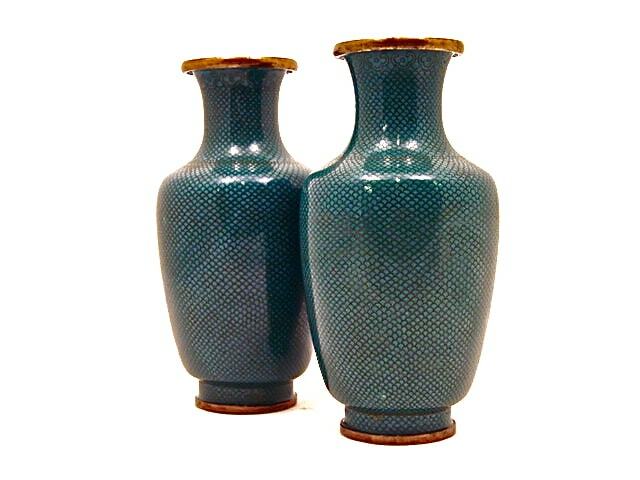 Many of the works created during this time used blue as the predominant color, leading to the Chinese name for the technique, ‘jingtailan’ (Jingtai blue ware). 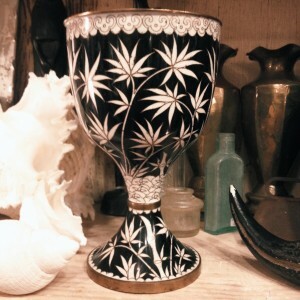 Over the centuries different materials and techniques were adapted and eventually quality began to decline in the 19th century. 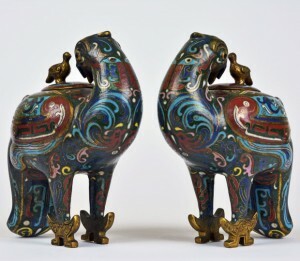 Chinese cloisonné is the best known enamel work in the world however some excellent adaptations exist in Japan, Russia, France and other small regions throughout Europe. Although the Japanese didn’t join the trend until the mid 19th century, some of their work has the highest technical quality in the history of this art. 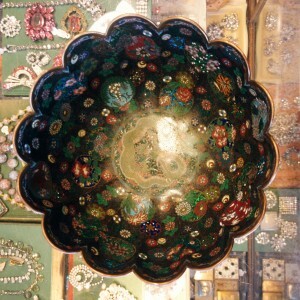 Present day cloisonné has taken on a reputation as a craft for sale or a tourist souvenir rather than a fine art. 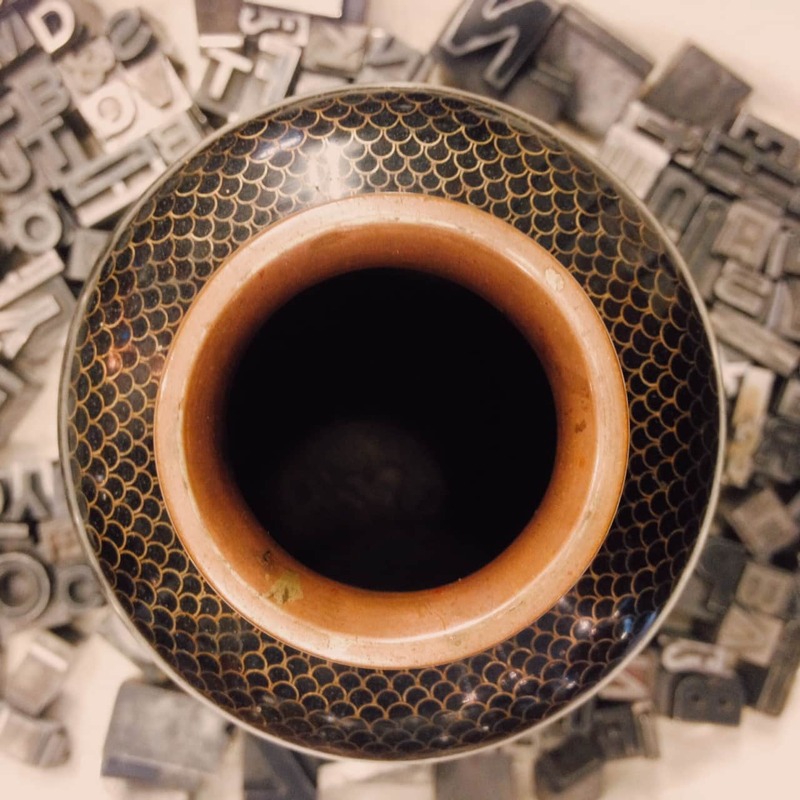 Although talented and devoted craftsmen still exist, pieces are often rushed or mass produced resulting in a lower quality final product. For this reason we value true antique cloisonné. 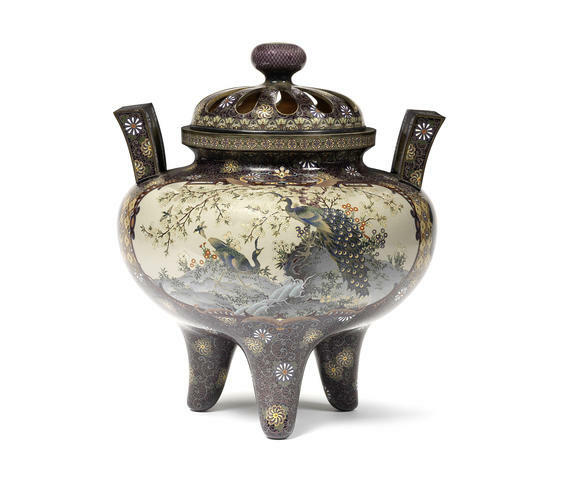 With such a deep history, genuine pieces from centuries passed can be a wonder for the eyes. 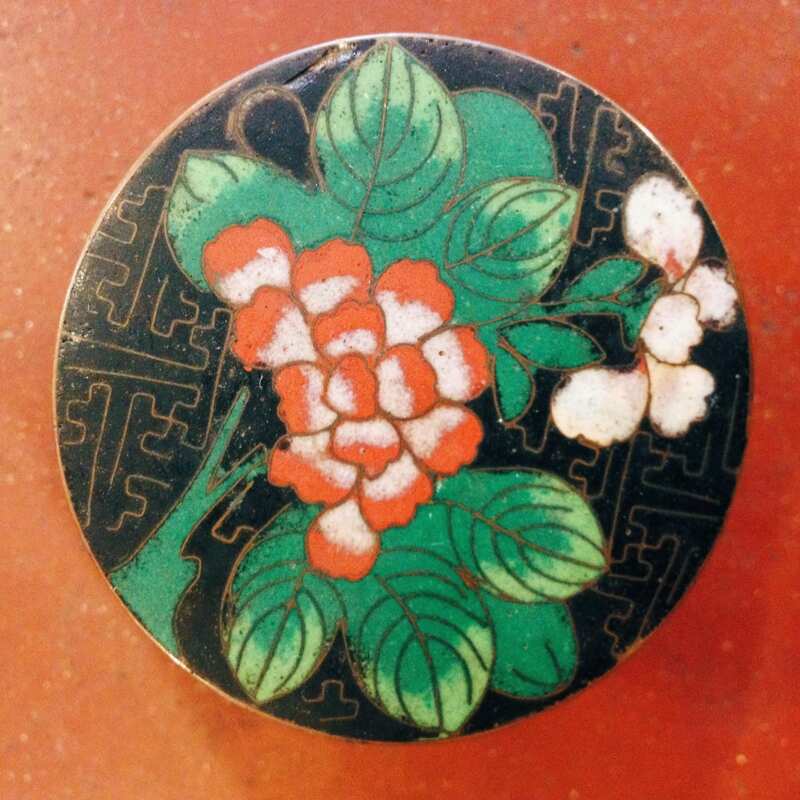 Even when the enamel shows wear from age or the copper has lost a bit of its original shine, there is great beauty in a cloisonné object from years gone by.